Pattaya diving - Jump in on the action! I wanted to scuba dive ever since I watched Jacques Cousteau on TV when I was a Kid. 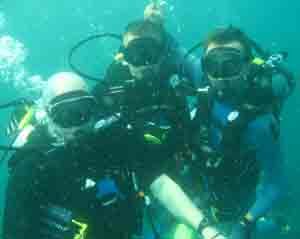 In Pattaya scuba diving was a great experience with the Adventure divers. That's where I learned how to Scuba dive in Pattaya. Robert Camp at Adventure Divers is a great Scuba Diving Instructor and has other excellent Diving Instructors working with him. 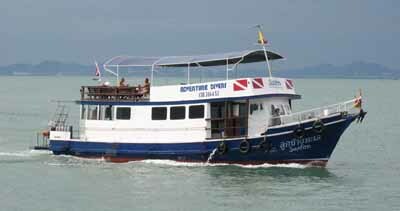 Robert's Dive Shop is an excellent and fun one stop Dive Centre in Pattaya. He even built his own Scuba Diving Boat. The "Saifon". Click on the boat to get a larger one. 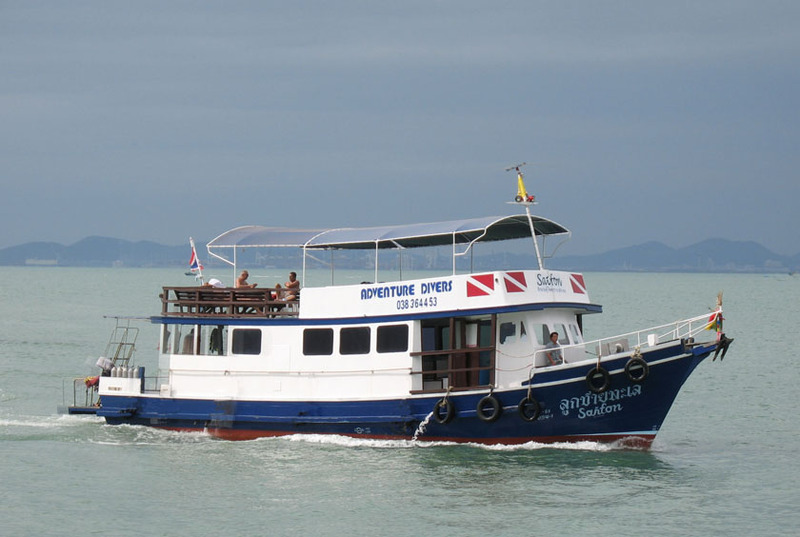 Have you always wanted to try Pattaya diving? ...but you don't know where. The real reason I never went scuba diving was because I never found the right school. 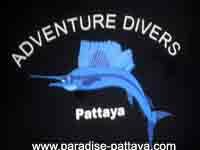 A Padi certified Pattaya scuba diving school. So I signed up for the Padi Open Water Diver Basic Course. Even a Thai Cook is on the boat and she cooks really yummy Thai food. Pattaya diving around the near and far Islands in the Gulf of Siam has been a great experience. I like the 1 on 1 instructions and the closeness to your Instructor which I believe is the most important not only as a beginner. You become close friends with the Instructor and/or your buddy as well. After all your life may depend on it if it ever gets "hairy". 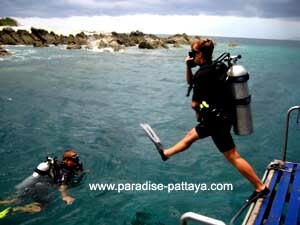 Scuba diving in Pattaya and the Gulf of Siam is an adventurous experience. Robert is able to take his students out on his boat, where most never go. • and his captain knows the area and the islands in and out. Robert is the tall guy on the left. The great thing was that they pick you up at your Hotel and take you to class or to the pier. So you really can just focus on scuba diving and enjoy yourself. The first day I studied the Padi Open Water manual book and watched the Padi videos with one of Robert's diving Instructors. It takes a day to study the course and the same day we went to a swimming pool near by and I learned all about the sign language under water. It's an easy and fun way to get used to the under water environment. You also get to know your Instructor which is important. That was fun in the pool. The second day Robert picked me up at my Hotel and we went out on the Boat, the Saifon. On the boat I got to know a few other first time divers and some experienced divers. It was fun to be on the boat with them. The older handsome fellow on the picture on the left is Max - the Senior Master Instructor. One thing on my -must do- list in Pattaya is Wreck Diving with the Adventure Divers. Robert and his Crew are great. I met a few of his Instructors and they are all great. The use of the boat and the scuba diving equipment is all included. On the boat they serve you excellent food. You are all taken care of and you can just focus on the course and enjoy yourself. The second time I went for a one week scuba dive in Thailand. You go around the Islands. There are quiet a few really beautiful small Islands. If you are interested in Scuba diving careers or a scuba diving certification / license you may want to talk to Robert. If you want to get in touch with Robert you can use the form below to contact him. He checks his email every morning before going on the boat and usually will get back with you within 48 hours. 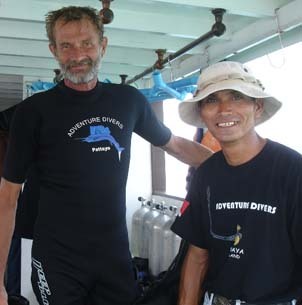 The Adventure Divers also offer DSD (discover scuba diving) 1 day courses. That's a great course if you want to find out if scuba diving is for you. He also takes groups Deep Sea Fishing and you can also Charter one of his boats.